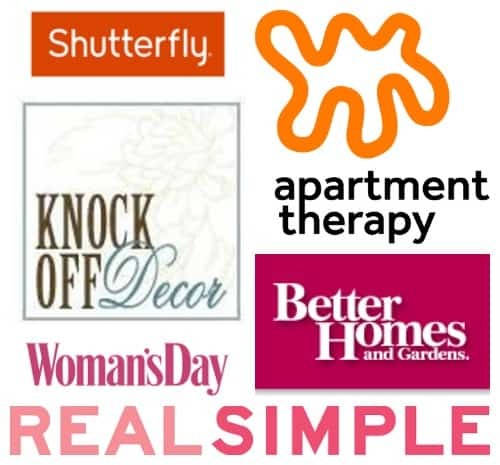 You are here: Home / decorating tips / Small Space Decorating Ideas with renter friendly tips! Small Space Decorating Ideas with renter friendly tips! Inspiration for small space decorating with renter friendly solutions in bright and colorful interiors. Optimize your small room with style and function! Hi there! How are you today? My family and I just went on a last minute summer vacation beach trip. We had a wonderful time exploring gardens, shopping, swimming, and eating. The hotel we stayed in was a one bedroom suite and had a really cute layout. Since we have to downsize when we move to Japan in January, I’ve been looking for inspiration on small space decorating ideas with some rental friendly tips! First, a few shots of our cute hotel suite overlooking the ocean. It felt very peaceful. Here are some lovely bright and colorful small spaces and why I choose them for inspiration. This small space feels large with a wall mounted tv cabinet and open coffee table giving the illusion of more floor space. A folding table mounted on the wall in a small kitchen is a clever way to provide extra counter space or a place to eat when needed. Add wall storage to your small kitchen to free up counter and cabinet space like a pot rack underneath upper cabinets. Using vertical storage is a must when working with a small blueprint. Low profile furniture provides plenty of seating in a small space but keeps the room airy and bright. This cozy seating arrangement can fit almost any living area. Get more ideas for furniture arranging and decorating with a FREE 5 day decorating email course! Use an extendable table to accommodate guests in a small dining room. Mix and match chairs for a curated designer look. Placing the dining room table against the sofa saves space when there is no room for a proper dining area. Isn’t this room gorgeous? You don’t have to sacrifice great style in a small space! Adding a breakfast bar that utilizes seating on both sides doubles as the dining table in this classic black and white space. Place a cabinet as a half wall to define different zones and provide more storage. So pretty and smart! If you have a small living area, store an ottoman under the coffee table for extra seating. Add a pony wall to create a cozy eating nook with banquet style seating. Use rugs to divide up your space into work, eating, and living zones. With some creativity and thoughtful furniture arrangement, a small space can be functional and stylish! But don’t stope here, find more rental friendly decorating tips in small spaces with 7 Easy Renters Tips and The Best Bedroom Hacks for renters. Pinterest never fails 🙂 And I hear you on the housing situation! I remember when I went to Germany, we stayed in a hotel for a month because they didn’t have our housing situated yet. But my dad had orders to be there. How crazy. the last time we went to Germany, I was in the 9th grade, we spent 6 months in a hotel because they lost our household goods!!!! when they found them we lived in temporary housing in a 5th floor walk up that had 8 bedrooms 2 kitchens and 4 bathrooms for 6 months then they moved us into “permanent” housing where we lived 4 months and then they moved us 90 miles away for the remainder of my Dad’s 3 year tour!!! Needless to say it was a very interesting time for our family of 5. Thanks for sharing your ideas. With a suitable design and using right home furniture, a small space will looks bigger than its actual size. Hello! My husband and I have a tiny house just no kitchen because we eat at the house with the family. We have a 12=22 building we call The Condo. LR is 12=10 and the bedroom is 12=12 with a half bath and a closet. My question is, how to get the most storage possible?? Wow, I would love to see pictures! I would use as much vertical space as possible, especially in the closet. Every piece of furniture you have should be serving double duty and should probably have storage too. Even if it’s just a basket tucked underneath a table or chair. Good luck. I love these space saving ideas. It is usually a problem to decorate small spaces. I enjoyed over reading your blog post. Your blog have nice information and I got good ideas. Thanks for this. Thank you so much Amanda! I’m so glad you stopped by and found inspiration!